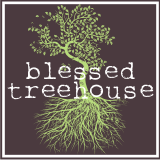 Blessed Treehouse: I wear them near my heart. If you know me, you know I don't wear jewelry (aside from my wedding rings). I have terrible allergies to most metals - even precious metals can cause an ugly rash. But when I saw these necklaces handmade by The Vintage Pearl, I melted. They are beautiful. And I wanted to wear the names of my precious children without getting a tattoo (trust me, I've thought about it). But could I justify spending money on jewelry knowing I might have an adverse reaction to the metal (sterling silver, in this case)? I told Matt all this, and to my surprise, he was listening. Shortly after sweet Harper entered our world, Matt presented me with a "push" present (even though I never pushed a bit). And guess what he gave me? I LOVE it. LOVE. LOVE. LOVE. I love wearing it. I love when people notice it. And I love wearing my babies so near to my heart. And the icing on the cake? I haven't reacted to it. Thank God. I didn't know you were allergic to jewelry. Me too! Okay, not really. I just don't think it goes very well with ratty t-shirts and jeans which is my outfit of choice most of the time. That's the coolest necklace evah. really cool and even more so because your hubby listened and surprised you! Lucky girl! I absolutely love them. I went to their website and could buy these for so many family members for Christmas. So here is your job Ali - WHEN we get our next little one you need to tell Brian about this website and said that I love them and would love to have one :) Thanks for sharing this.